Who can join the tours? Barging is a vacation for all ages: Children as well as adults will find plenty of ways to make this their ideal journey. Simply relax on board, or combine the barging with activities like city tours, biking, walking, swimming, fishing, or … Since the landscape is never the same, our trips are perfectly suited for the seniors. are warmly welcomed on board. However, it is impossible to add extra beds to our cabins. This means that children will get their own cabin. The discount for children is listed with our prices. Does the tour leave time for local visits? The barge will travel approximately 5 hours per day. Every night the ship will be moored in the centre of a historical city or in a nice natural surrounding. This means there is plenty of time for your mainland activities, be it visiting a city, a walk through nature or a bike ride. The ship is approved for passenger transportation and has full safety equipment including life vest for everyone. Even for Noty, our ship’s dog! For children that cannot swim we have suitable life vests on board. For smokers among our passengers: due to safety regulations smoking is only allowed on deck or in the steering house. Smoking is not permitted on the lower deck or in the cabins. What language should we speak? Both Olga and Maurits are licensed captains and look back on many years on board of various ships. They are experienced to be in touch with passengers. Apart from the Dutch language, both are reasonably fluent in English, German and French language. They will definitely do their very best to give you an unforgettable stay on board. Is a travel insurance included in the booking? No, it is recommended to arrange a travel insurance that covers your personal risk and possible cancellation of the booking from your side. Ask any travel agency or your insurance agent. Your personal expenses and trips. Transportation to and from the barge. Canal- Bridge- and harbour fees for the barge. Drinks from the honour bar. Fuel (for five travelling hours per day). Your travel and cancellation insurance. Use of the ships Bicycles. Divers playthings for your entertainment. Those who want to charter the full barge can take a free option on the suggested date. A simple e-mail, fax or phone call is enough. An option will become void if it is not changed into a real booking within 14 days. Sending us the filled reservation form which you find in our brochure, on the Internet, or which we send to you on simple demand makes a booking. You will receive a confirmation of your booking after our reception of the first pre-payment of 30% of the total price. Does the barge immediately leave port on the first day? No, we welcome our passengers on the first day around 7 PM. You will have plenty of time to unpack, get to know your colleague passengers and familiarize yourself with the ship. We will at the same time inform you about our safety rules. 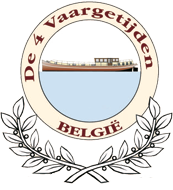 The barge “De 4 Vaargetijden” will leave port on the next day after breakfast. Must I wash the dishes? Luckily no! We take care of all housekeeping services during the trip. Our guests are only responsible for their own cabin. Can I bring my favourite beverages? A full selection of beverages and snacks is available from the honour bar in the living room. Of course we have a nice selection of Belgian beers and chocolates. Strong alcoholic drinks and special wines are missing, so feel free to bring your favourite brand. Our guests dispose freely of our 8 bicycles we carry on board. Those who really prefer their own gear can of course bring it with them. There is no need for formal clothing. Leisurewear is probably the most comfortable clothing for the journey. Do not forget well-worn shoes for your mainland activities. Since temperature might change from day to day we recommend our guests to bring clothing that can be worn in multiple layers. That way clothing can easily adapt to the weather conditions. A light water/wind tight coat is necessary. But, most importantly, bring your sunglasses!